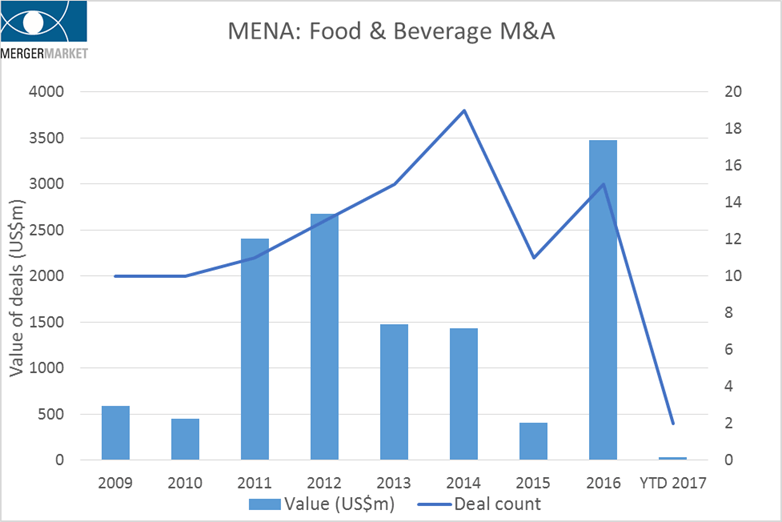 Dubai, United Arab Emirates: Mergermarket, the leading provider of M&A data and intelligence, has reported that Food & Beverage sector deal value for the full year 2016 surged to over US$ 3.4 billion, from just US$ 402 million the previous year. Total deal value for the year was the highest since the data provider first reported on the sector’s M&A landscape in 2009. Four deals in the Consumer sector have been announced so far this year worth US$ 104 million with a strong pipeline predicted for 2017. The data was announced at Mergermarket’s MENA Mergers 2017 forum, which took place at Jumeirah Emirates Towers in Dubai on 8th May. Deal value in the Food & Beverage subsector so far this year has been driven by consumer giant, Nestlé’s, acquisition of Caravan Marketing Company, a leading Egyptian instant coffee company and owner of the Bonjorno brand, for US$ 33 million. The acquisition reflects Nestlé’s ambition to invest in Egypt and the fast development of a rapidly growing soluble coffee segment which has been gaining popularity in the region. Another headline hitting deal to watch is Brazilian meat producer, BRF’s, sale of a stake in its halal food unit, One Foods, which could be worth an estimated US$ 5 million. Interest in the asset dropped following Brazilian police reports revealed a criminal investigation of the country’s meat industry. The stake may be targeted by Saudi Agricultural & Livestock Investment and the sovereign wealth funds, Abu Dhabi Investment Authority and Qatar Investment Authority. Following a slow start to 2017, M&A deal activity in the sector is expected to pick up in the second half of the year. Mergermarket intelligence suggests that a further flurry of small-cap deals are expected including Emirates Modern Poultry Co (Al Rawdah), who are mulling over a US$ 20-30 million joint venture in Kuwait and Oman to increase their export capabilities. In March, Mergermarket reported that Lebanese food chain Shawarmanji was in advanced discussions with a private equity firm over a stake sale. Shawarmanji has signed franchise agreements to launch 50 outlets in Saudi Arabia in the next seven years, with discussions to open further franchises in Oman and Egypt and plans to enter Europe by the end of 2018. Mergermarket’s MENA Mergers 2017 forum was attended by leading MENA transaction professionals, who examined deal trends in the region as well as ideas on the outlook for M&A in the Middle East. The Forum was hosted in strategic partnership with Baker McKenzie, EY, Standard Bank, AIG, Instinctif Partners and iDeals Solutions. The forum is followed by Mergermarket’s second annual Middle Eastern M&A Awards, which will recognise transaction advisory achievements across a range of sectors including ‘Energy, Mining & Utilities’, ‘Financial Services’, ‘Consumer’, ‘Pharma, Medical & Biotech’, ‘Telecoms, Media & Technology’ and ‘Industrials & Chemicals’. MENA Mergers 2017 will include Mergermarket’s Middle East M&A and Private Equity Forum, as well as the Debtwire Middle East Corporate Restructuring Seminar and the Mergermarket North Africa Summit. The forum will focus on the main deal drivers in the MENA M&A market and look ahead to the key investment trends likely to be seen during the coming year. Panels, presentations and case studies will be given by representatives of the Middle East’s leading corporates, investment banks, private equity funds and financial & legal advisory firms. The event will be attended by corporate development and M&A teams, private equity professionals and business owners, investment bankers, financial advisors, lawyers and transaction services professionals. Mergermarket will host MENA Mergers at Jumeirah Emirates Towers, Dubai, on Monday 8th May, in strategic partnership with Baker McKenzie, EY, AIG, Standard Bank, Instinctif Partners and iDeals Solutions. 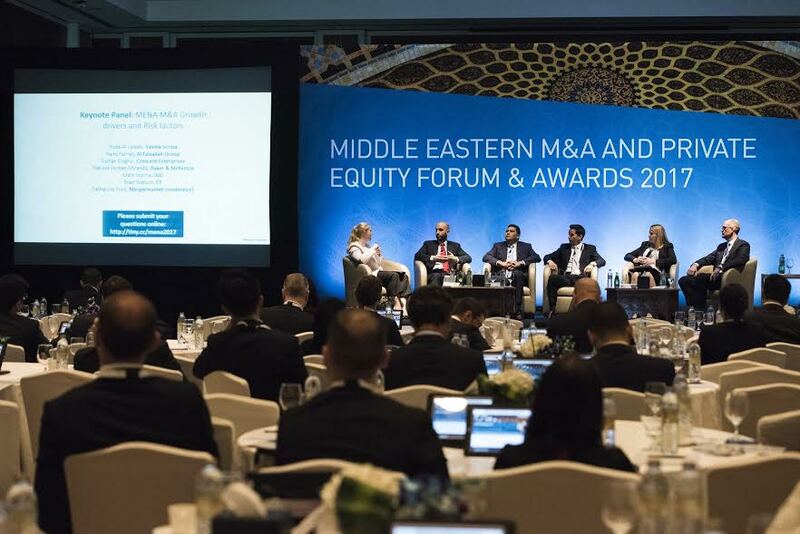 The forum will be followed by Mergermarket’s second annual Middle Eastern M&A Awards, celebrating excellence in M&A legal and financial advisory in the region. Mergermarket is the must-have intelligence and news service for anyone involved in mergers and acquisitions. Since the company was founded in 2000 we’ve expanded to 65 locations across Europe, North & South America, the Middle East, Africa, and Asia-Pacific. We’ve also got the largest team of dedicated M&A journalists and analysts anywhere in the world. We’re part of The Mergermarket Group, which is the fastest-growing business in its sector.